At a time we need healing after the poll, not many would go against the president’s decision to opt for an inclusive administration, without compromising party purity and the spirit of sharing the spoils of war. If an electoral battle has been won, the next stage should be to seek to wipe the tears of those grieving their loss. Between the patience of a president and the truculence of a party man, there is a hungry chasm spoiling to swallow the whole nation. President Muhammadu Buhari says his second coming is going to be a calculated departure from the past, when he and his party were shy to run an inclusive government on account of the sharply divisive politics that preceded his advent. So now, although the cloud of bitter politics is still overcast, Buhari says he’s about to deal with it through patiently accommodating interests outside his political family. That is the reasonable and guarded interpretation most watchers are giving his declaration after his victory at the poll of February 23. 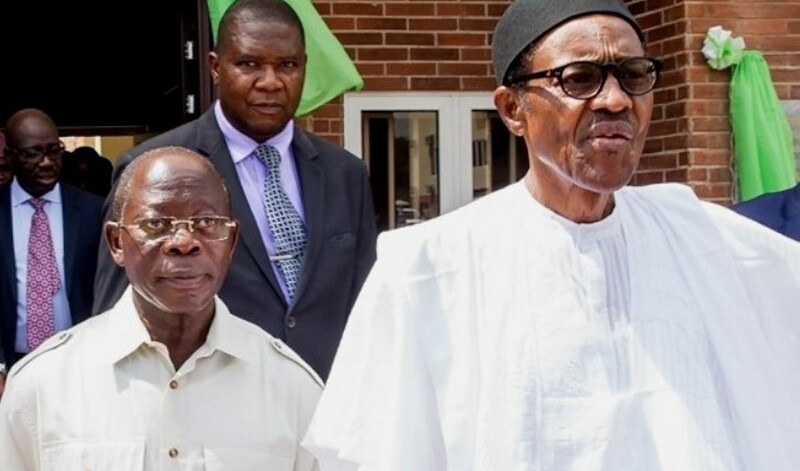 But Adams Oshiomhole, the national chairman of the president’s All Progressives Congress (APC) has presented what contradicts his master’s position. Addressing newly-elected APC members of the House of Representatives, a bellicose and war-thirsty Oshiomhole said all the spoils of office in the incoming National Assembly will be pocketed by his party. He declared that: “We will not share power…We should make this thing clear so that those who may not understand what is happening don’t fall into the trap.” He gave no room for the opposition to have a ‘say’ in the National Assembly in the business of nation-building. His explanation is that he doesn’t want APC to experience the mistakes of the past when the party lawmakers were left on their own and wolves in sheepskin moved in to scatter them. But isn’t it possible that Oshiomhole’s belligerent actions would do more of ‘scattering’ the party and the nation now than the lack of imposition in the House leadership allegedly caused? The ‘mistakes’ the ex-labour leader is scared of might again come upon the party, and more frighteningly, upon the nation in a larger shape. With grave consequences. At a time we need healing after the poll, not many would go against the president’s decision to opt for an inclusive administration, without compromising party purity and the spirit of sharing the spoils of war. If an electoral battle has been won, the next stage should be to seek to wipe the tears of those grieving their loss. It’s not as if you’re turning over your hard-won victory to your ‘adversaries’ or opponents. But it’s the price you pay for peace to be won. You don’t create a cold war after a ‘hot’ one. A cold war tends to be wear you out over the years, more than the open one does, as the world witnessed between the West and East in the subterranean hostilities that succeeded World War II between 1939 and 1945. Many who support the former Edo State governor allude to a so-called party supremacy to give his argument ammunition. It is primitive talk in a liberal setting. They forget that in the larger consideration, the party itself must stand relegated at the summons of higher national interests the lawmakers are called upon by the people to pursue on their behalf. It is unhealthy and disruptive for the polity if all we do after an election is to have a confrontational and contumacious conquistador like Oshiomhole whose consuming preoccupation is to trigger new battles that leave no room for a conducive atmosphere for development and movement to the next level. His posturing that APC, despite its lack of absolute majority especially in the Senate, can corner all the ‘loot’ brought from the warfront is filled with pitfalls. The national chairman of the party believes only the decreeing of leaders in NASS can guarantee exclusive custodial ownership of election booty. How about the potential injury to the independence of the legislature, considered to be the face of modern presidential democracy? The party leader’s argument that the winner must take all is dictatorial, undemocratic and contemptuous of the norms of civilised governance. The main worry however is that where you have a legislative chamber stripped of powers to order its own house and has to lean completely on the government and the party, it has in effect handed over the mandate it received from the people to outsiders. The party and the executive must recede, somehow, to the shadowy margins after the election of an independent legislature. If these two must contribute to their leadership, it mustn’t be by fiat the way APC is going about it. It must be through principled consensus and negotiations, with all the legislators across the parties involved. We are on the way to installing marionettes posing as lawmakers if we allow Oshiomhole to have his way. It’s like merging the executive and legislative wings of government. We won’t benefit from the staying strength of the checks and balances that a true separation of the organs of government promises in the presidential system in that world. Many who support the former Edo State governor allude to a so-called party supremacy to give his argument ammunition. It is primitive talk in a liberal setting. They forget that in the larger consideration, the party itself must stand relegated at the summons of higher national interests the lawmakers are called upon by the people to pursue on their behalf. That’s an assignment infinitely superior to that of an ideologically bereft, pillage-seeking party asking to subtly corrupt and undermine the sanctity of the nation’s most important arm of government. That’s suicidal to a democracy still said to be in its nascent stage, some two decades after we birthed it!